If things go the way the Democratic chairman of the House Ways and Means Committee wants, he will get President Trump's tax returns for the past six years, and he will get them by tomorrow. That is the deadline Congressman Richard Neal set in a letter to the IRS. 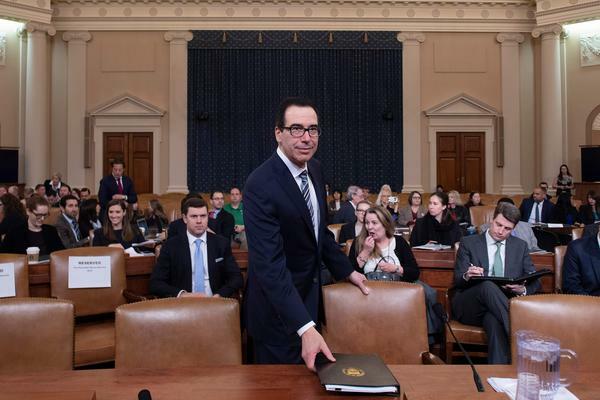 Both Treasury Secretary Steven Mnuchin and IRS Commissioner Charles Rettig were testifying today on Capitol Hill, and the returns became topic A, as NPR's Peter Overby reports. PETER OVERBY, BYLINE: Mnuchin and Rettig went up to Capitol Hill to testify about next year's budgets for Treasury and the IRS. The questions started immediately. Democrat Mike Quigley, chair of an Appropriations subcommittee that oversees Treasury, asked Mnuchin who was making the decision about complying with Congressman Neal's letter. Mnuchin said Treasury lawyers were working on it and other lawyers, too. STEVEN MNUCHIN: Our legal department has had conversations prior to receiving the letter with the White House general counsel. OVERBY: This is an issue because the law that Neal is using was crafted to keep the request between Congress and the IRS. Mnuchin said he was out of the loop. MNUCHIN: I want to be very clear and not be misleading. I acknowledge that there were conversations. I am not briefed on the full extent of those conversations. OVERBY: Almost all of the presidents in the past 50 years have made their tax returns public, voluntarily. Trump has not, and questions about his tax returns have piled up since he took office. Quigley went to the history books. MIKE QUIGLEY: Richard Nixon, Gerald Ford, Nelson Rockefeller all had congressional hearings relating to their tax returns. OVERBY: That was this morning. In the afternoon, Mnuchin told the House Financial Services committee his lawyers hadn't asked the White House for any permission. MNUCHIN: We consulted, which I believe was appropriate of our legal department. CAROLYN MALONEY: Well, I think the fact that there was any communication with the White House about this is deeply troubling and certainly violates the spirit of the law, if not the letter of the law. OVERBY: That was New York Democrat Carolyn Maloney, who said more digging was needed. Mnuchin had this exchange with Financial Services Chair Maxine Waters. MNUCHIN: I'm not afraid of being fired at all. WATERS: OK, and you are clear. And I'm very pleased you're not afraid of being fired. OVERBY: Meanwhile, the Appropriations subcommittee that had questioned Mnuchin was moving on to IRS Commissioner Charles Rettig. When Trump's tax returns came up, he tightened visibly and turned away several questions as inappropriate. Georgia Congressman Tom Graves, the ranking Republican on the panel, decried the Democrats' approach. TOM GRAVES: It just seems like we have a chairman and, potentially, a party that is attempting to weaponize the IRS for political gain. OVERBY: But the history of this law is also relevant. Congress passed it in 1924 to get at the Teapot Dome bribery scandal and conflict of interest problems in the Harding administration. Peter Overby, NPR News, Washington. Transcript provided by NPR, Copyright NPR.